Rosy-pink Spanish membrillo with an aged cheese plate is delightful. Yet, I had never cooked a quince myself until this last week. As the seasons begin to hint at a change here in the Bay Area, the leaves turning orange, red, and golden and the air crispening and making one hanker for a warm pot of soup and an old-fashioned chicken pot pie…..Wait! Alright, that is certainly not the beginning of fall here in San Francisco. Right now we are having what seems to be the hottest day of the year. Almost every September and October are like this, a delightful extension of summer (or a blissful reimagination of the dreary foggy summer we actually had). And every year on these warm and golden sunny fall Saturdays I seem to find quince at the farmer’s market. It is difficult for me to resist ogling at the fruit. Quince is such an “ancient” fruit, popping up in some of the earliest known literature and certainly trumping Adam and Eve’s “apple.” The ones I have seen are so innocuous. They look like bumpy and irregular (even ugly) apples or pears–nothing flashy about them. What the heck would I do with it anyways? Last weekend, I snagged two pounds of freshly picked quince and decided to try something new. I perused various sites (including this fun fanatical one) and cookbooks for inspiration–lamb and quince tagine, a variation on a favorite Persian khoresh, quince preserves (uh…membrillo), roasted quinces with whipped cream, and a lovely looking quince salad with gorgonzola dolce in the latest of Ottolenghi’s cookbooks. All of the authors marveled similarly about the transformation that a quince undergoes in order to be savored at its most lovely, fragrant, and delicious. One begins with a greenish-yellow, mostly unyielding fruit. Peel away the skin and core the middle. 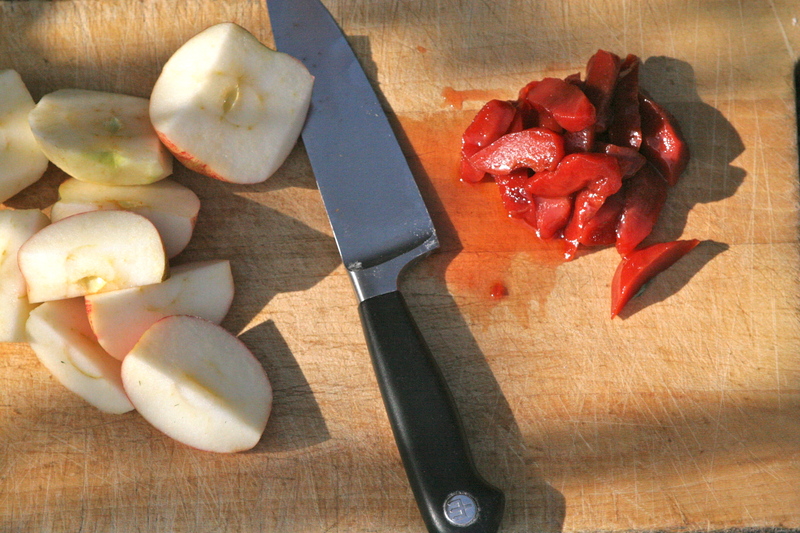 Keep these throw-away pieces to cook alongside the quince. You can toss them at the end. The inside texture of the quince resembles an apple or a very unripe pear, as white as can be. After two or three hours of slowly poaching on the stove or roasting in the oven, however, the pale wedges of quince transform from tan, to rosy, pink, and finally, if one waits long enough, crimson red. It seems miraculous, or at least alchemous, like something that Marlowe’s Faust would have concocted. Ta-da! Helen of Troy and quinces. I elected to poach my quinces in quarters in a simple syrup with just half a wedge of lemon because I really wanted to see what the fruit itself tasted like and I wanted to be able to control a slower poach than roasting them or poach-roasting them (pouring poaching liquid into a roasting pan) in the oven to get the dark crimson color. They were delicious and not too soft. 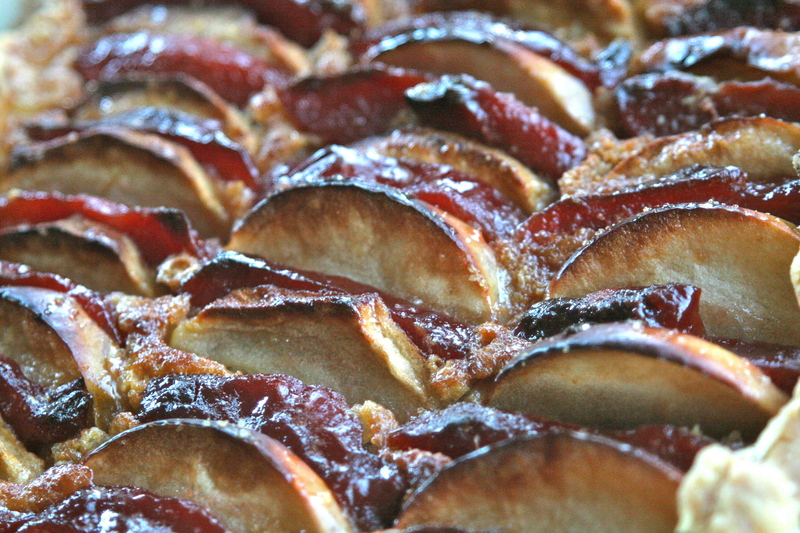 This time around I decided to mix several of my poached quince wedges with some Gravenstein apples on a frangipane tart. I made a really flaky all-purpose flour crust, but I think that next time, given the sweetness of the fruit, I would go for this crust with whole wheat to offer a more complex range of flavors. You can cook this free form as I did or cook the tart in a removable bottom tart pan (just take out the bottom and cook the whole tart in the ring but on top of a parchment lined baking sheet). And try to be sparing with the frangipane. 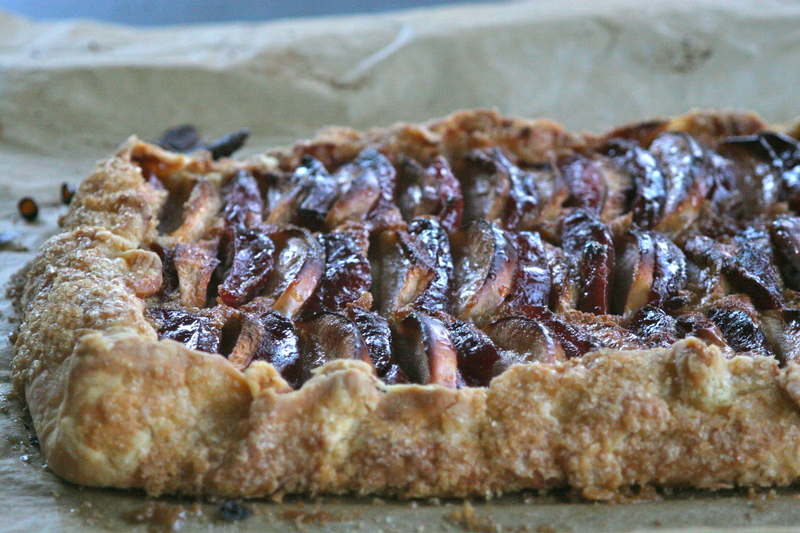 Just a thin layer along the base of the tart is all you need. And last, but not least my alchemists, this would be stunning with a dollop of creme fraiche spiked whipped cream. Preheat the oven to 375F degrees and line a rimmed baking sheet with parchment paper. If making a free form galette, roll the tart dough fairly thin, about 1/4 inch thick (either in a circle, or a rectangle). 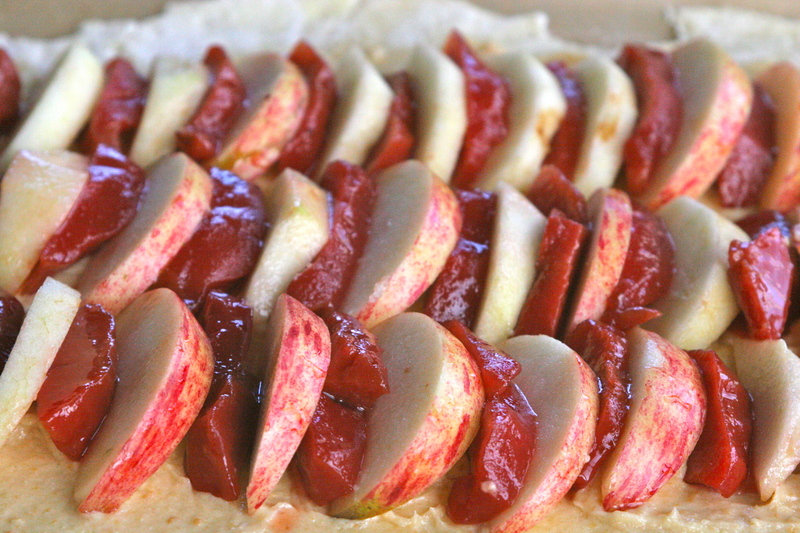 Spread a thin layer of frangipane over the tart dough, leaving about a 1 1/2 inch border. Arrange the fruit in concentric circles or overlapping parallel rows over the frangipane, depending on your tart shape. Drizzle a little of the poaching liquid and the honey over the top of all the fruit. Cut the butter into little pieces and scatter them over the fruit. Fold up the sides carefully, gently pinching the folds as you go. Brush the folded sides with milk or cream and then sprinkle with a little extra sugar to adhere. Bake for 45-50 minutes. Bring the sugar, water, lemon half, and spices (if using) to a boil and remove from heat. As you peel, core, and quarter the quince throw everything, including the peels and cores, into the poaching liquid so that the quince does not begin to brown. Once you have finished all of your quince, bring the liquid to a very light simmer, likely the lowest heat possible. Place a lid that is smaller than your pot on top of the liquid and weight it down with one or two small teacups to keep the fruit submerged during poaching. Cook for 2 to 4 hours depending upon how soft the fruit was to begin with and how soft or red you want the quince to turn during cooking. Allow to cool somewhat and discard the cores, peels, lemon half, and spices. 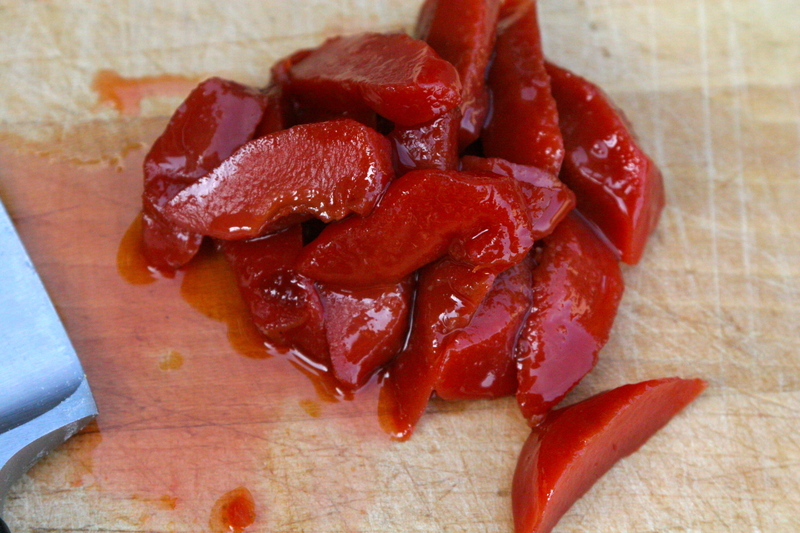 Set aside the poached quince and then reduce the syrup, if you would like. 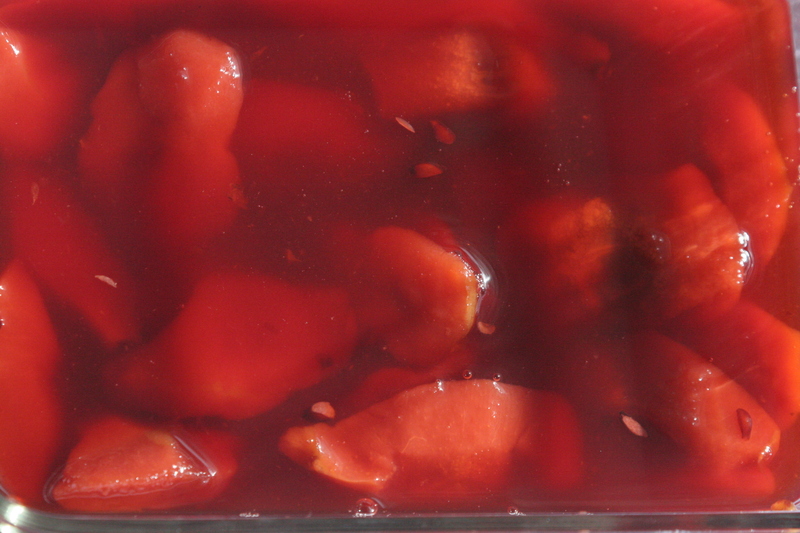 Cook on high for another 5 or 10 minutes and then pour it back over the quince and refrigerate until ready to use. Combine the flour and salt. With a pastry blender or two forks, incorporate the tiny cubes of butter until the mixture resembles little peas. Slowly pour in the ice water and stir around with a fork until a shaggy mass comes together. Dust a clean surface with flour, pour out the dough, and then knead the mixture two or three times until it forms a rough ball. Pat into a disk, cover with plastic wrap and refrigerate for at least 2 hours before using (or in an extreme pinch, 30 minutes in the freezer). In a Cuisenart type food processor mince the almonds with the sugars and salt to form a fine powder. Add the butter and whir until incorporated. Add the egg until incorporated. Take aside 1/3 to 1/2 of the final amount for your tart and freeze the rest for another use. 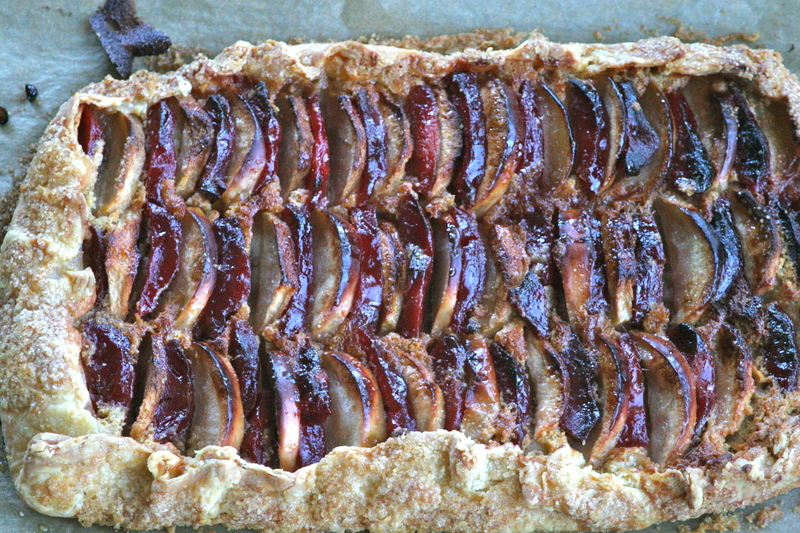 This entry was posted in Almonds, Dessert, Nuts, Rustic Fruit Desserts and tagged Gravenstein apple quince tart, how to cook quince, ideas for cooking with quince, quince apple frangipane recipe, quince apple tart recipe, quince galette, quince tart with almond paste, what to do with quince. Bookmark the permalink. 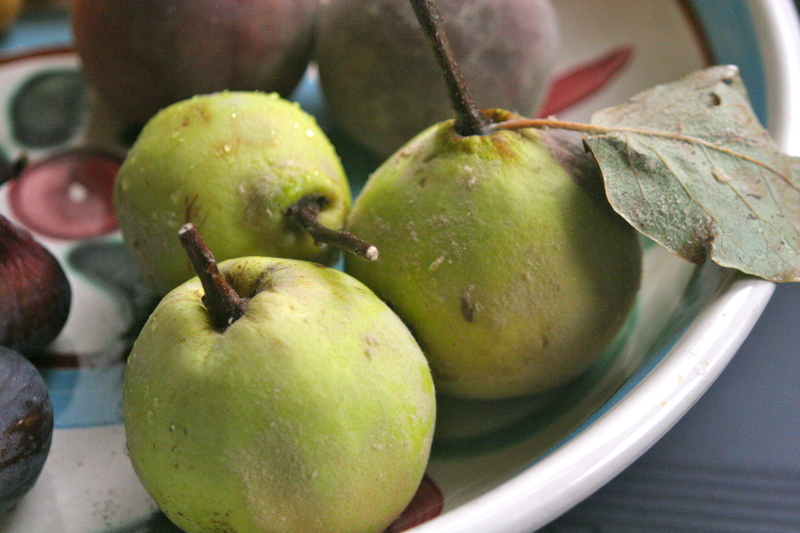 My paternal grandparents used to have a quince tree right in front of their house, and I remember picking the quinces each year, making a puckered face after just one attempt to eat them ‘raw’ (as if I had forgotten what they had tasted the previous summer), and then eating them hours or days later baked (?) in the oven with some sugar on them: a simple but delicious transformation. I am way too intimidated to try cooking anything like this, but it is lovely to read about it. Your writing about food is becoming ever more fluent and inspired. I am jealous. I would love to have a quince tree. I can dream. Thanks Tea. I have to guess your neighbors would not mind if you took a few of those quinces, especially if you brought them a slice. I love the pictures you posted awhile back of the quince blossoms too.